Summer is finally upon us and we are ready to take advantage of longer, sunnier days. Our favorite summer activities include pretty much anything involving having fun in the sun. And while we certainly enjoy spending more time outside basking in the warm sunshine, we also know the importance of making sure our skin is well protected and well moisturized. Since you all know that we’re huge fans of all-natural beauty products, it’s no surprise that we added a sunscreen to our list made with 100 percent vegetarian ingredients. The bottle is also biodegradable and air-powered. Lately we can’t get enough of these tinted lip balms from bareMinerals. Not only will your lips stay hydrated all day long, but these lip balms come in eight beautiful hues. Enriched with passion fruit seed oil and vitamin E, your lips are getting optimum nourishment. The summer months sure can take a toll on your locks! Sun exposure and chlorinated pools take the moisture out of your hair and leave it feeling dry and hay-like. This reparative hair masque restores your hair to its moisturized glory days. Aveeno Active Naturals Sheer Hydration lotion is a Team LC personal favorite. We love how this moisturizing body lotion is unscented and made with natural ingredients too! Apply liberally to your whole body after a day spent lounging by the pool. We cannot stress enough how important it is to take care of your skin during the summer months (and all year long!). Since excessive sun exposure tends to dry out your face and skin, this NARS Restorative Night Treatment replenishes dryness and revitalizes your complexion overnight. Just rinse it off when you wash your face in the morning and your skin will be glowing all over again. Prevent sun dried and damaged hair before it even happens! Our newest obsession is this Clarins hair sunscreen spray. Not only is the formulation non-greasy and water-resistant, but also protects your hair and body from damaging UVA and UVB rays. What more could you ask for? Warning: This is another all-natural product that we’re swooning over. 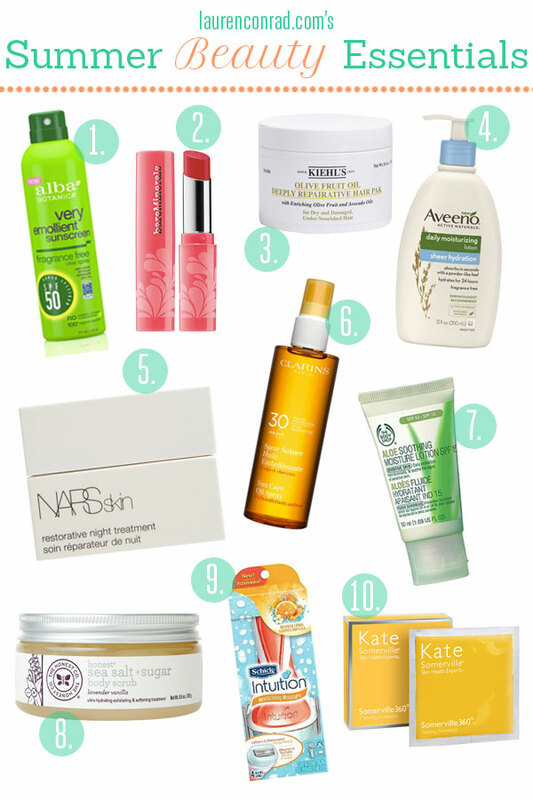 Sunburns happen to the best of us, so we’ve picked the best product to help sooth your skin. The Body Shop’s Aloe Soothing Moisture Lotion is fair trade, preservative-free, dye-free, fragrance-free, and soap-free. Basically it’s the only aloe you’ll ever need! Gorgeous glowing skin starts in the shower. Made with whole grain sugars and Pacific sea salt, this Honest Co. body scrub provides your skin with a gentle yet deep exfoliation. If you didn’t know already, The Honest Co. makes some of our all-time favorite all-natural home and body products! Like the rest of our favorite summer beauty products, having a razor that protects and moisturizes your skin while shaving is just as important. Show off your summer skin without the fear of razor burn or ingrown hairs! By now you should all know how harmful tanning beds are for your skin and health. Dark spots, premature aging, wrinkles, and skin cancer are just a few scary repercussions. We want to protect and love our skin for years to come and that’s why we love the Kate Somerville Tanning Towelettes. These sunless tanning towelettes produce a natural-looking, streak-free glow, sans sun! Leave us your suggestions in the comments!